This year, we commemorate 375 years of Sir Isaac Newton, one of the greatest minds of the 17th century Scientific Revolution. Considered the most famous ‘Master of the Mint’ who worked to revolutionise British coinage, what more of a fitting tribute to celebrate his 375th birthday than one of the coins he is most strongly associated with. 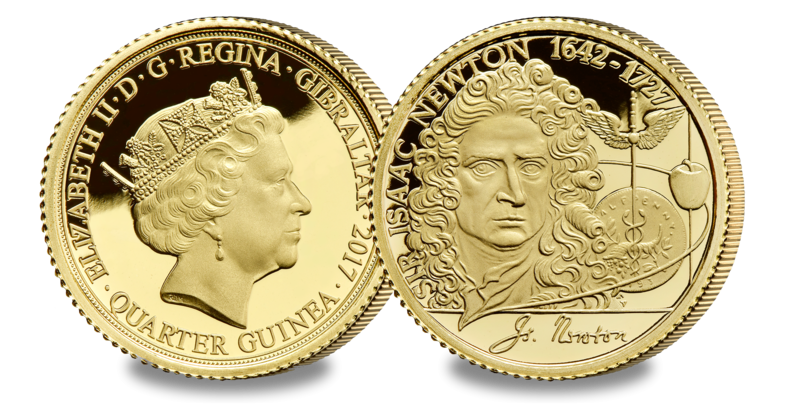 You now have the opportunity to own the Sir Isaac Newton Quarter Guinea, featuring a stunning new portrait of Sir Isaac Newton, alongside the iconic apple that inspired the development of his law of gravity. Alongside this occasion is the 300th year since the British adoption of the Gold Standard, a movement Newton played a significant role in. The set has been expertly crafted by prestigious coin designer Francesca Abbate – her first British coin! With an extremely low mintage limit of just 1718 available worldwide, this piece is guaranteed to be incredibly popular and so will sell out quickly.